Regular section meetings for Otters, Timberwolves, and Pathfinders are held on the first Sunday of the month at Joaquin Miller park, from 2 to 4 pm, rain or shine. Our meeting spot is the Redwood Glen grove off Skyline Boulevard, near the start of the Big Trees Trail (a short ways down the trail from the roadside parking area on Skyline). 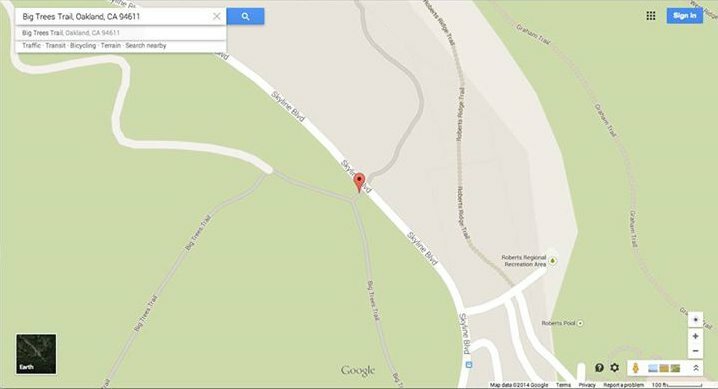 Clicking the map will take you to Google Maps, but please be warned that the map does not appear to render correctly on some phones: if you are accessing Google from your phone, please double-check to make sure the pin is in the correct position at the start of the Big Trees Trail! In addition to the section meetings, there will be at least one other group activity every month, usually also held on Sunday afternoons. Parents who wish to assist in these activities are welcome, as are younger siblings: the BPSA informally refers to little brother and sister “tag-alongs” as Chipmunk Scouts. Mon. January 21st, MLK Jr Memorial Grove, 10 am-12 pm: All-sections service project, shoreline cleanup with EB Parks. Wear comfortable, weather-appropriate clothes and closed-toed shoes. To cut down on the use of plastic, please bring a refillable water bottle and bucket to pick up litter. Heavy rain cancels the event. Driving directions from I-880 in Oakland: take the Hegenberger Rd. exit and drive on Hegenberger Rd. toward the airport (west). Turn right on Doolittle Dr. (.75 miles) and right on Swan Way (next light). Drive 200 feet and on the left side is the entrance to Arrowhead Marsh. MLK Grove is the first parking lot on your left. Sun. February 17th, Coyote Hills Regional Park 1:30 pm-3:30 pm: Ohlone village site tour led by Francis Mendoza of #AsianOutsider. $5 parking fee. Sun. April 7th, Redwood Glen at Joaquin Miller Park, 2-4 pm: section meetings. Sun. April 28th, Sunol Regional Wilderness, 2-4 pm: Wildflower walk. Meet at Camp Ohlone Road trailhead at the southernmost parking area. $5 parking fee.